Once we receive your newly and precisely selected high quality custom hearing instrument, we will schedule an appointment with you so that you can be properly fitted with the new instrument. We highly recommend you bring along a family member or friend with you to this appointment. To ensure that you are outfitted with the most customized hearing instrument, we include all the necessary fine tuning and programming associated with real ear computerized measurements and self report assessments of hearing instrument outcome, performed by an experienced Board Certified Hearing Instrument Specialist. We want to make sure that you are fitted with the best possible hearing instrument, which is why we provide a 60-day trial period with all new hearing instruments. We conduct the all-important follow up meetings as a vital component of the evaluation, testing, and instrument fitting process. These meetings are critical to monitoring your progress, for example, in acclimating to wearing your new hearing instrument. We can also determine if any adjustments need to be made to the hearing instrument so that it continues to improve your hearing, and eventually your overall communication ability. If you are a first-time wearer of a hearing instrument, your follow-up visits may be more detailed, as you acclimate to the new device. For more experienced hearing instrument wearers, the follow-up visits will go much quicker. In most cases, we are generally able to fully optimize your hearing instrument between three to six weeks. At Master Plan, our commitment to you doesn't stop when we deliver your hearing instrument. Our commitment is to see you through the entire process of improving your hearing ability so that you can begin to enjoy a fuller, richer quality of life, with a dramatically improved hearing experience. 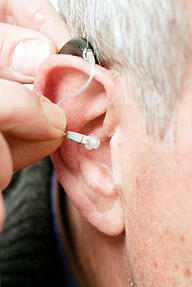 A person with hearing loss does not recognize the problem, because hearing loss often occurs gradually over many years. The stigma that wearing instruments is a sign of getting older. The overall cost of hearing instruments. Given the value and benefit of a dramatically improved quality of life from the wearing of a pair of hearing instruments, the cost can be less than a few dollars a day.